I've never heard of a foster parent for animals. What is it? There is absolutely no person more valuable to a rescue organization than a foster parent. In fact, animal rescue would be all but impossible if it weren't for the caring souls willing to open their hearts and their homes to these animals in desperate need of a temporary safe environment. I don't have the time to keep a dog forever. Would foster parenting be for me? We are often approached by people who wish to help the animals but don't have time to volunteer every weekend or don't have the resources or time to care for an animal permanently. Fostering is a perfect opportunity for those unable to volunteer in other areas to make a positive contribution to the life of a needy animal, and is most definitely a worthwhile and noble act of kindness. Foster parenting entails nothing more than allowing an animal who is in the rescue's system to stay in your home and receive the love, nurturing and daily care that any animal deserves until he or she finds a permanent home. Although we can never guarantee how long this will take, the average is several weeks, however it could be as little as a few days or as much as a few months. A foster parent has the right to discontinue fostering at any time for any reason, so if you feel that you're no longer able to be a foster parent you are always given the option to stop. Homeward Hounds provides all medical care, food and other necessities for the animal. All you need to provide is a safe, loving environment until he or she is able to find a permanent one. And again, you always have the option to discontinue fostering. "But I don't think I could be a foster parent, I'd become too attached"
One of the most common remarks we in the rescue business hear is, "I could never be a foster parent because I'd become too attached & wouldn't be able to part with the animal." Believe me when I say that those of us in rescue understand this sentiment completely. It would be absolutely impossible for us to take in these animals, nurse them back to health, worry about their health and safety 24 hours a day and spend every weekend at adoptions with them without developing a bond that can only be described as that of a parent and a child. We understand the pain of letting them go, but we also understand that the work that we do gives life to those who would otherwise be suffering incomprehensibly. And we understand that when we let go of an animal it's to let him or her begin the life that he or she so deserves. Foster parents are a huge part of this life-saving process. It is a self-sacrifice and, while it seems difficult to those who have never experienced it, the foster parents who once thought it too painful have told us that the experience was more rewarding than they could ever have imagined. Please keep these things in mind and if you have room in your home and in your heart, foster homes are desperately needed. 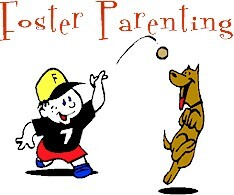 If you're interested in becoming a foster parent, please e-mail us.